WINOOSKI – In a stunning revelation that is changing everything about how Americans look at finance, a new study released last week has shown that when families and individuals spend all of their money, they have no more money left. This seems to hold true even for people who make larger amounts of money, which many assumed would not be the case. One couple making $500,000/year were simply astonished that, after spending all of their money on bills, vacations, debt payments, and then $10K of “extra stuff,” they hardly had any left. 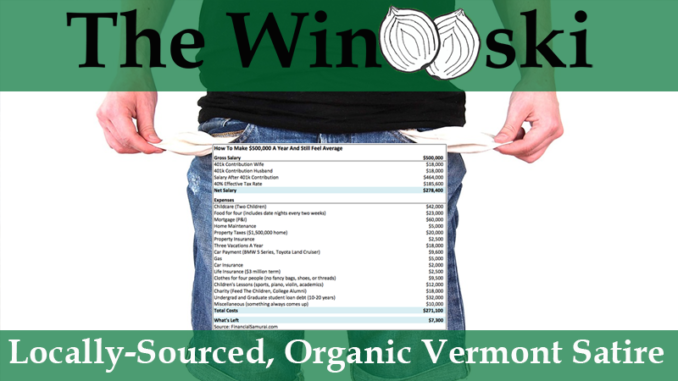 People all over Vermont were quick to empathize, as they admitted to having their own struggles with money not being available after being spent on luxuries. Whether the new data will bring about any long-term change for Vermonters remains to be seen, but for now you can take comfort in knowing that your money problems were never your fault. A system where spending your hard-earned money causes you to lose it is clearly a broken one.